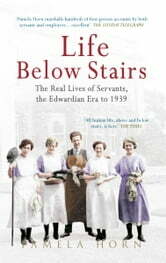 In 1931 domestic service remained the largest female occupation in Britain. We view it today as an undesirable job, owing to the class divide it has come to represent, and this is reflected in the portrayals of mistresses and servants in books and on the screen. However, it was seen as the perfect way to equip young women with the skills necessary to become good wives and mothers, and continues to be a career taken up by many today. But what do we really know about how girls felt when taking up these positions in other people A|s houses, or how they were treated? Indeed, how has the domestic role changed over the years to incorporate nannies, au pairs and domestic staff in hotels, hospitals and other institutions? This first major study of domestic workers in the twentieth century includes first-hand accounts and reminiscences from men and women working in this sphere. Pamela Horn uses these sources, as well as official records and newspaper reports, to extract the truth about the lives and status of men and women in domestic service from A Ai900 to the new millennium. The reluctance of many women to return to service after the two world wars is discussed, together with government efforts to persuade them otherwise. Overseas recruitment is not forgotten, as a number of young women were trained in government centres for employment in the colonies, and many also came from other countries looking for work. Written with authority and from a national perspective, this well-researched study is essential reading for social historians and anyone with an interest in modern history.